The popularity of pre-schools in this country shows that Irish parents have long recognised the importance of early childhood. They are not wrong – the first five years of life are crucial for the development of future physical, cognitive, social and emotional functioning, and if children are neglected during this stage of their life, no level of intervention later on can make up for it. ChildFund is now ensuring that children in the poorest and most deprived parts of the world receive the same benefits as our own. Until recently, many children in these regions arrived at school-age physically and emotionally under-nourished, and with no understanding of basic concepts such as numbers. As a result, very few were able to take advantage of the benefits of education and go on to higher studies and professional employment. Moreover, the social attributes of empathy and co-operation were stunted, leaving communities stuck in a paradigm of individual survival rather than social transformation. When one considers this pivotal contrast between our own upbringing and those of populations in the least developed parts of the world, it is much easier to understand the gulf between societies, and how some regions have remained stuck in the cycle of poverty. The good news is that this is changing. Irish Aid are co-funding an ongoing programme to bring the benefits of ECD to marginalized communities in three African countries – Uganda, Ethiopia and Mozambique – who are sharing their experiences to develop the most effective practices and greatest value for Irish taxpayers’ funds. Local people are already noticing the impact ECD is having, not just on the children who participate, but on whole communities. In Gondola District, Mozambique, Mrs Isabel António heard of the ECD programme through word-of-mouth reports of the dramatically improved school performance of those who had been involved. She immediately sought to have her own daughter (pictured) enrolled, and now says the benefits are visible not only in the enthusiasm her daughter has for learning, but in her relationships with the rest of the family and the valuable knowledge they have all gained in matters such as health and hygiene practices. What is really exciting is that this is just the tip of the iceberg. 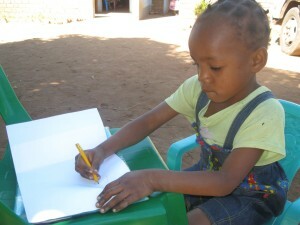 The benefits of ECD reveal themselves in the long-run and at the societal as well as individual level. And with the programme on track to reach 1700 children under five years old by 2015 (in an area with a population similar to County Galway), there is a bright hope for this community that a new generation is emerging with the potential to break the poverty cycle for good. The government and citizens of Ireland should be rightly proud of their contribution to this watershed moment.